Once in a while a restaurant will get a reputation for a funny gimic or unique feature, most of the time it’s needed only to cover for other deficiencies. Lambert’s on the other hand developed its unique gimic as a result of over the top customer service. 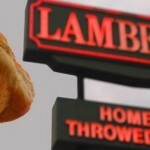 The story goes that many years ago when Lambert’s was founded, during a very busy dinner rush, the owner wheeled out a cart of fresh rolls and an over-anxious customer who across the restaurant just couldn’t wait for the cart and told him to “just throw it”. Then another made the same request and another and another and another, until their calling card was written. Now, as quickly as the cart of warm hot rolls arrives, it’s emptied. They can hardly keep up with the demand and you see the disappointment in customers’ eyes when the “roll thrower” runs out. These aren’t regular rolls, these things are delicious, especially with honey or with one of their standard “pass arounds” sweet sorghum. But, their generous portions and these pass arounds are really what bring the locals. They’re served from pots carried by the waitresses and are included in your meal no matter what you order. They include fried okra, macaroni and tomatoes, fried potatoes and onions and black eyed peas. We ordered a vegetable plate but Lambert’s is probably best known for their meat dishes like chicken and dumplings or chicken-fried steak.